During our days here, we will share practical experiences and celebrate the positive results of a plethora of bridge building efforts taking place in over 90 countries through our Interreligious Councils and similar structures and programs. My focus today will be the spiritual motivation, the moral foundation, and the emotional dynamics of our work. I believe that we need a self-critical dialogue appreciating our strength and acknowledging our failures. To me, religion for peace is religion for change. These words transcend time and space. They are congenial to the spirit of every religion. Let us who are gathered here under the emblem of Religions for Peace, find inspiration in these generous words of blessings for all peacemakers, none excluded. Peacemakers are called the children of God. A new translation is even stronger; "God calls us his children"- his sons and daughters. Blessing is a unique expression of faith. A blessing is more than good wishes. It conveys a God-given potential for change and a divine offer for a new beginning. The essence of a divine blessing is that we are welcomed by God and embraced by love. Its impulse is for us to share this love in welcoming the other. To welcome the other is to bless the other. At this World Assembly of Religions for Peace, we will struggle with contemporary issues of religion and peace. We will be reminded that this is a time for religious leaders to be humble and self-critical instead of pompous about power and position. Religion for peace is a bold statement of faith. This is our great belief: religion is for peace, not for war; for justice, not for injustice; for love, not for hatred. At a time when many are weary of religions that say one thing but practice another, we must assert that religion is for peace, again and again. We need to convince the world that religion is a genuine force for good, not a poisonous wellspring for death and destruction. In this spirit we need to reflect on the place and role of religion in the world today. We need to develop visions for a future of reconciled diversity, tolerance, and mutual respect. We need to explore these challenges not with timidity, but with determination. We are here to meditate on the transforming power of faith and the frailty of human leadership. We speak to religion and to politics, these two interconnected and mighty forces shaping individual life and human destiny. Why, we need to ask, why this frequent cry: Keep religion out? Maybe the answer is religious leaders who do not admit the depths of depravity exposed in the name of faith? Indeed, we need to wake up to the complicity of religion with oppression. Yes, we need to take seriously the challenge of those who reject religion as a credible source for good. They draw on painful human experience. Religions for Peace humbly asserts that religion and peace belong together - that peace is not only a state of mind, but a mind of state. We argue that religion belongs in the secular as well as in the sanctuary, and that true spirituality is expressed in personal devotion and in social action. We reassert this fundamental connection between religion and society at a time when fanaticism is on the rise, when sectarianism and nationalism are disfiguring not only the face of faith, but destroying communities. We witness today a growing fear of the other - his faith, her beliefs, their social habits and culture and values. Conflict begets fear, and fear is the seed of conflict. Therefore, we must demonstrate that faith is the opposite of fear. As a world assembly of religions, we are conscious that we are different from each other in many respects and that we will remain different. The beauty of this assembly is in spite of this, we have the opportunity to convince the skeptics of the healing potential for faith if we warmly accept one another. While others doubt, we risk a hug that would overcome entrenched barriers and destroys walls of separation. My remarks are informed by my years as a leader of the European Council of Religious Leaders (ECRL) and of the leadership of the world body of Religions for Peace. ECRL brings together leaders of most religions in Europe, including those of the Abrahamic traditions and others with a shorter history as established religions on this continent. We all have the same voice regardless of numeric strength. The council has, through a number of statements and declarations, addressed the particular challenges for today's Europe in welcoming the other. We have issued seminal statements on such topics as tolerance, human rights, and establishing a culture of peace. The importance of these statements is primarily in their message, but they also carry special weight as consensus documents of a council with broad representations of all the major faiths in Europe. We have taken a stance that all religions should be visible in the public square, for the right to display religious symbols, and to build place of worship which conform to each religious tradition. When Religions for Peace holds its world assembly here in Europe, we are conscious of the heavy burden of history, the horrors of crusades, religious wars, and world wars that have shaped faith and life in this continent. Here, at the crossroads of a continent increasingly affected by under currents of intolerance, we want to voice a message of mutual respect. The Norwegian terrorist, Anders Behring Breivik, committed unspeakable atrocities under the pretext of saving Europe from the onslaught of Islam. Our response must be to honor the positive contribution of Islam to European history. Let there be no doubt after this assembly: Islam belongs to the past, present, and the future of Europe. Here in Vienna, on November 9th, Jews, Muslims, and Christians came together to reflect on the 75th anniversary of the Kristallnacht. In Norway, a young girl had to cancel her appeal for a similar event due to death threats. On the Kristallnacht, more than 1400 synagogues and Jewish prayer houses were destroyed in Germany and Austria, in the first major demonstration of Hitler's plan to annihilate European Jewry. It was a first station on the way towards Auschwitz, Belsen, and the other concentration camps, which are forever seared into world history as examples of humanity's capacity for ultimate evil. In 1970, the German Chancellor Willy Brandt fell on his knees before the memorial of the Jews in the Warsaw ghetto. Later, he is reported to have explained that this was not planned, but at the abyss of German history, under the weight of millions who were murdered, he did what man does when words fail. Let there be no doubt: from this platform, in the name of Religions for Peace, we unequivocally condemn every old and new form of anti-Semitism. The Christian faith has shaped the history of Europe. It has contributed to the spiritual and moral fiber of the peoples of the continent. Christian Churches will continue to mark the local communities with their community-building message and service. It rests upon governments and European institutions to honor the values implanted by this heritage, values that defend human dignity and human rights. Let there be no doubt. Christian witness will continue to shape the lives of young and old in Europe, for all generations to come. At this moment, we need all people of faith more than ever. Bigotry and intolerance are on the rise, and threaten the peaceful diversity of our continent. The fatal abuses of capitalism, and the spread of the market economy and its soulless materialism, have caused great misery and deep depression in many European countries. The traditional welcoming spirit in many countries has been quelled by joblessness, social deprivation, and deep anxiety. Young and old are experiencing a new age of despair. This makes Europe a fertile ground for propaganda against foreigners, and the rejection of the other whose situation is even worse. As servants of world religions, we are here to call on European citizens, their leaders and institutions, to multiply their attempts to curb the increasing number of neo Nazi groups and extremist political parties. These elements are spreading unfounded fear. They are feeding on nationalistic sentiments. Their delusion of superiority is demonstrated in hatred of the "different" other. Today, the Roma people are the most discriminated population across Europe. They, too, were targeted for extinction by Hitler. Today, they represent the lowest social class in every European country, despised, harassed and rejected. Their dignity must be respected and protected. It should be deeply disturbing to people of faith that, increasingly, European countries are fortifying our borders to keep out asylum seekers and refugees, especially from Africa and Syria. Europeans are forgetting how we are welcomed around the world. Today, our cynical response to turmoil elsewhere is to close our hearts and shut our doors on those who, out of despair, are seeking rescue on our shores. Borders are built to keep the poor out. This goes against the ethics of every religion and belief system. Add to this litany the increase in hate speech in social media and violence in the streets of Europe, and the frequency of racist outbursts and subtle discrimination. Hate crimes are on the rise. This is the other face of a continent that boasts a commitment to open society and pluralism that takes pride in its own Human Rights Convention and is the home of the International Criminal Court. In Europe and beyond, globalization may be a positive force for peace, development, and the rule of law. But the reaction to globalization is also evident in fear of losing one's own identity, thus increasing nationalism and religious isolationism. Also on the African continent, the Muslim Al Shabab continues to spread death and destruction, as recently witnessed in Kenya. Other Al Qaida connected groups are attempting to destabilize several countries. In Nigeria, Boko Haram, fuelled by historic tensions between Muslim and Christian d regions, brings despair to both neighborhood and nation. In Asia, tensions and conflicts continue to cause misery and death. In Myanmar, the process towards democracy and freedom is marred by the attempt at ethnic cleansing, as evidenced by attacks on the Rohyngia population. This conflict is about nationality, race, ethnicity, poverty, and human rights, with religion as a marker of identity. The onslaught has widened to endanger Muslims in other parts of the country. International concerns are widespread, and the UN human Rights ambassador has called on religious leaders to be engaged in solving the conflict. Buddhist nationalism, contrary to the ethos of Lord Buddha, is a cause of concern not only in Myanmar, but also in Sri Lanka. Hindu/Muslim tensions are an ever-present threat to communities on the Indian sub-continent. In countries like Iraq, Pakistan, and Afghanistan, the distortion of religion and misrepresentation of the message of the Prophet have contributed to unrest in those countries. In the Middle East, the Israel/Palestine conflict, with no solution in sight, is about history, land, poverty, human rights, freedom, and security, but it also about religious identity. It is also about holy history, holy land and holy city. The promise of the Arab spring is being put in jeopardy as attempts at democracy are derailed. The clock is being turned back to the time of autocratic rule and oppression of religion. In Syria, the nation is in shreds, and the people are bleeding to death. Millions have been displaced or are refugees in neighboring countries. A multitude of religious factions are engaged in a civil war with no end in sight. A particularly obscene form of violence is the almost daily targeted attacks by suicide bombers on holy sites, on worshippers in their sanctuaries, on innocent men and women and their children, especially on their holy days and during pilgrimages. In these cases, the religious element becomes particularly evident. Holy days have become hellish days. And to the world, it epitomizes the callousness and inhumanity of people who profess to be driven by religion. What can we learn from these depressive scenarios of the certain groups targeting the other, both in Europe and worldwide? Is there a role for Religions for Peace? Of course there is. That is our raison d'être. Let me suggest a few steps in a strategy for conflict prevention and transformation. Firstly, we must continue the interreligious approach of dialogue and common action. If religion is to play a role for conflict prevention and transformation, we must boldly, and with perseverance, pursue avenues of dialogue and cooperation. The well-established strategy of regional structures on every continent, with independent national councils in more than 90 countries, needs to be expanded. Key to its success is that religious leaders in every country own the councils; it is their responsibility to define and implement viable and contextually relevant programs to prevent conflicts and bring healing and harmony. The involvement of women and young people is crucial so that our movement has the broadest possible ownership, and so that it becomes deeply rooted and develops in a grassroots, bottom-up fashion. We must build synergies with moderate forces. We must identify possible confluences based on shared values. We must be open to cooperation between different religions, civil society, and state actors. Ours must be openness towards dialogue with all stakeholders, not excluding any one who is open to dialogue. Secondly, we must face up to the intra-religious challenge. There are situations that cannot be adequately addressed from outside, but must be solved from within as an intra-religious matter. The Shiite-Sunni divide is one of the most dramatic conflicts on today's world stage, affecting not only millions and millions of innocent lives, but demoralizing religious leaders and undermining the great legacy of the Prophet. Religions for Peace must continue to encourage Muslim leaders to draw on the wellspring of moderate Islam. Existing fatwa, and teachings of prominent Islamic scholars which declare terrorism un-Islamic, must be disseminated globally. Thirdly, we must strengthen a comprehensive education for tolerance. Young people are lured by promise of heavenly reward, or brainwashed in religious schools, to join terrorist groups in armed conflicts. In no uncertain terms, we must make it clear that war in the name of God is war on God. God cannot be honored by bombs. Such heresy offers destruction rather than salvation, despair rather than hope, enslavement rather than freedom. Fourthly, we need to strengthen our strategy for freedom of religion. Without freedom of religion there can be no true dialogue and no honest common action on the ground. Under the pretext of fighting extremism, freedom of religion is being impinged upon in many countries. Freedom of religion, freedom of assembly, and freedom of expression are inseparably linked. Legislation to secure freedom of religion must be implemented by central and local administrations. The level of social hatred is increasing in many countries, even if the political will to curb religious intolerance is stated policy. For Religions for Peace, freedom of religion must be a priority. One highly important element in such a strategy is the establishment of The Universal Code of Holy Sites, which aims at protecting places of worship, shrines, and cemeteries. This work deserves wide support on the state, national, and international level. Fifthly we need to promote justice, truth and reconciliation, the rule of law, and respect for human rights. If in the name of God, democracy is being scorned, human rights scoffed at, and the rule of law denigrated. Religion must promote the law of respect and the respect of law. It is imperative for religious leaders to address specific crimes against humanity and war crimes. The key to all transformations is truth, justice, and reconciliation. Many truth and reconciliation processes have skipped the justice issue. But victims have long and painful memories. They may be suppressed out of shortsighted political expediency, but if not addressed, they tend to resurface. Suffice it to mention the examples of Argentina, Chile, and Cambodia. Even the celebrated truth and reconciliation process in South Africa, which set a standard for many other similar processes, may have taken the justice issue too lightly, giving cause to social unrest. This demands courage and integrity from religious leaders to advocate for justice, tolerance, and mutual respect. There are unfortunate cases where religious leaders are silenced out of fear for their own security. Finally, we need to support the agenda of civil society and of organizations promoting international law and global peace. One of our most promising options is to build alliances based on a shared commitment to the integrity of every human being and to our life-sustaining environment. The struggle against climate change is congenial to the moral principles of all religions. After the Millennium Development Goals, which were grounded in religious ethics and values, our support should be mobilized toward a viable post- 2015 strategy for sustainable development. Likewise, the efforts underway at the Human Rights Council to promote a declaration of human rights to peace, reflects a widely shared religious conviction. The struggle to rid the world of weapons of mass destruction enjoys broad religious support. The issue of nuclear weapons has been on the agenda of Religions for Peace since its beginning, in Japan, in 1970, and it must be accelerated in support of a binding UN convention against nuclear arms. The death penalty is sanctioned in religious texts, but need not be interpreted as the mandatory reaction to certain crimes. Today, religious leaders cannot escape the challenge posed by an increasing number of states that are abolishing the death penalty. If a secular state upholds the sanctity of life, in abolishing the death penalty, how can religious leaders continue to promote this inhumane practice? In conclusion: we must keep alive the dream of a transformed humanity. As we have recently celebrated the 50th anniversary of Martin Luther King Jr.'s famous "I Have a Dream" speech, we are reminded of the importance of dreams. His dream of the Promised Land easily translates to the struggles of oppressed people on every continent. Religions for Peace, is a dream waiting to become true. One of our esteemed leaders, the Nobel Laureate Archbishop Desmond Tutu, speaks of God's dream for our planet and for the human family. This time, in the heart of Austria, in the historic capital, we are here to close the gates of Vienna to xenophobia and hatred. We are here to open the gates of Europe to truth, justice, and reconciliation. It is my prayer, that in the cold European winter, we will sense the fragrance of a spring yet to come. That we hold onto the dream of the Promised Land as we yearn for the morning yet to dawn. To dream of the Promised Land is to mirror the dream of God. To share God's dream is the beginning of transformation. Religion for Peace is a dream yet to be fulfilled. 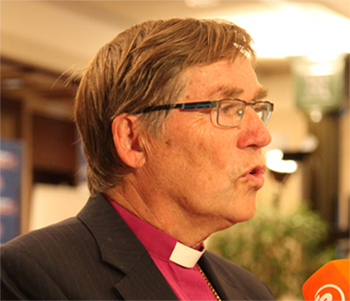 Dr. Gunnar Stalsett is Bishop emeritus of Oslo, Former Vice Chair of the Nobel Peace Prize committee, and Moderator of the European Council of Religious Leaders, Religions for Peace.